How can I quickly add one program (or folder) to the favorite tools toolbar? Simply drag & drop the item to the favorite tools toolbar while you hold the Alt key (or while holding Shift and Ctrl keys together). I have defined my text editor as favorite tool. How can I open the text file with the text editor now? Select the file you like to open and click on the favorite tool button. Alternatively you can drag & drop the text file over the text editor icon. My favorite tool can not open the file, if an empty character (space) is in the file name. What can I do? In the main menu go to “Tools → Favorite tools → Favorite tools edit…” (or use Shift+Ctrl+Y). 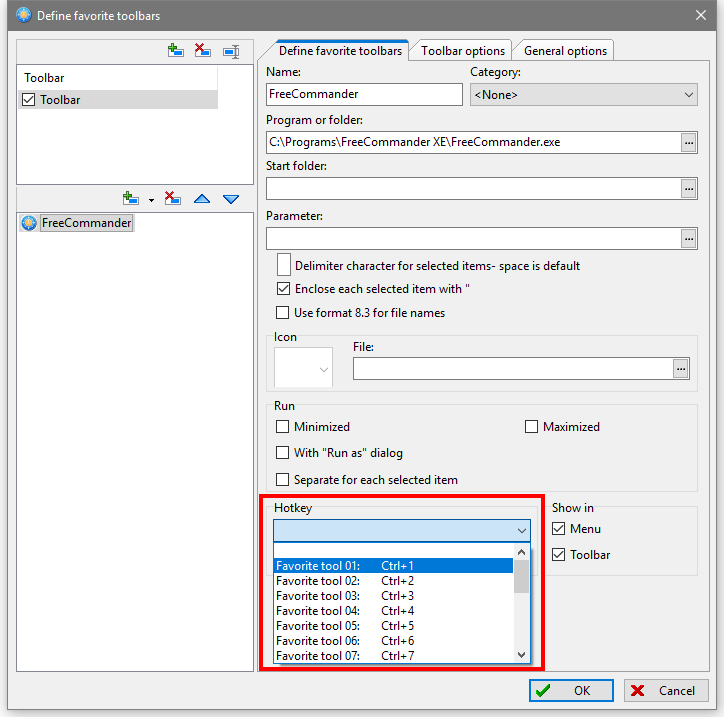 Then select your tool (program or folder), and then select the option “Enclose each selected item with” . Alternativly you can try also the option “Use format 8.3 for the file names”. Can I open my favorite tool with the keyboard shortcut too? Yes, you can define it in the “Define favorite toolbars” window, to open it, in the main menu go to “Tools → Favorite tools → Favorite tools edit…” (or use Shift+Ctrl+Y). Then select your tool (program or folder), and finally select your keyboard shortcut from the drop-down menu, within the “Hotkey” area. Favorite tools shortcuts are Ctrl+0, Ctrl+1,… Can I change these default keyboard shortcuts? Yes, you can change the keyboard shortcuts for favorite tools in the “Define keyboard shortcuts” window (“Favorite tools” section). To open this window, in the main menu go to menu item Tools and select “Define keyboard shortcuts…”. I would like to see the icon to my favorite tool in the splitter bar. Is it possible? It is possible, but only if the keyboard shortcut is assigned to the favorite tool. To do this, open the “Define favorite toolbars” window (Shift+Ctrl+Y). Then select your tool (program or folder), and then select your keyboard shortcut from the drop-down menu, within the “Hotkey” area. To add this favourite tool item to the splitter bar, right click the splitter bar, select “Customize action toolbars…”, scroll down the list of commands to the “Favorite tools” section and double click the item you want to add to the splitter bar, then click the “Apply” button.